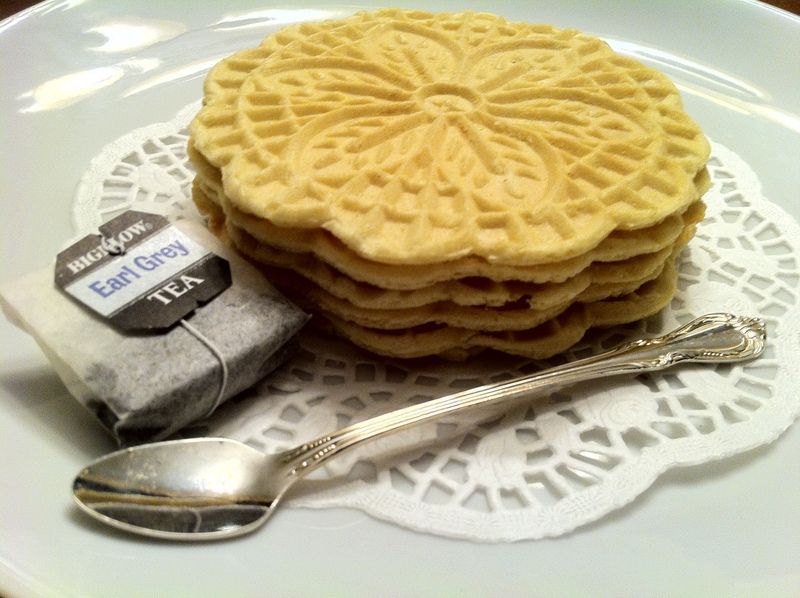 Pizzelle; a great place to start when sharing some of my traditional holiday baking recipes. Known to be one of the oldest cookies, it is thought to have its origins in Rome. Although traditionally flavored with anise, it can also be flavored with lemon or vanilla. Use whichever flavor you prefer. The pressing of the wet dough between the hot iron imprints the beautiful snowflake pattern which always attracts my kids’ creative nature. They love helping make these. Anyone who knows me appreciates how much I love my morning coffee, but even more, they also understand the peaceful joy a hot cup of Earl Grey can bring me in the afternoon. The pizzella is the perfect accompaniment to an afternoon cup of tea. Pizzelle irons can be pricey. I originally inherited mine, however, when the electrical cord frayed it set me on a search. Ultimately, I found my current one in the clearance aisle at Carson Pierre Scott for more than 50% off. If you are so inclined, put yourself on a mission to find a used Pizzelle Iron. It might set you on a path of establishing a new and fun holiday tradition of love in your family. *You can substitute Almond, Lemon or Vanilla Extract (Use a flavor you prefer). Beat eggs. Gradually add sugar. Beat until smooth. Next add cooled, melted margarine. Then flavoring of your choice. Mix. Add flour and baking powder to the egg mixture. Mix, being sure to scrape unincorporated flour from the side. Dough will be sticky enough to drop from spoon. Heat Pizzelle iron. Spray well with Pam. Drop dough by teaspoonfuls onto the heated iron. Press shut and cook for about 1/2 to 1 minute. Cooking time will vary slightly from one Pizzelle iron to the next. Discard first cookies. Repeat process. Stack cookies on a wire rack to cool. Store cookies in a cardboard box lined with wax paper. Can be stored like this for weeks at room temperature. Do NOT store in airtight Tupperware or they will become soggy. Photos by suebthefoodie. © suebthefoodie.com, 2011. Recipe shared with me by Shirley May.